Who is that dude with all those eggs on his head? 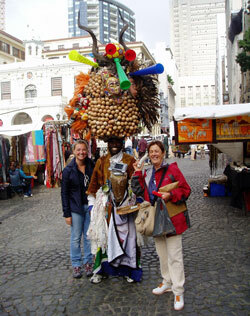 Egg Man appears at Greenmarket Square come rain or shine and at all the hottest festivals in South Africa, adding an air of Rio-style festivity wherever he performs. His name is Gregory da Silva - a comedian artist, storyteller, dancer and live street performer. Egg Man was born in Benin West Africa, which is Voodoo Country. He speaks French and English and is living in the Mother City. Wearing an invincible smile and a twenty five kilogram headdress, he always turns heads as he strolls around Greenmarket Square. Each day his outfit sports a new feature, presenting the city centre with a new display of his symbolic African art and culture. His body is armoured with artefacts and his face painted with tribal patterns. Gregory's warm voice is lively and he repeatedly offers phrases and words in French. Gregory performs at the Grahamstown National Arts Festival, the Hermanus Whale Festival, Klein Karoo National Kunstefees and many others. He has been hired to receive guests at hotels and airports and appeared on SABC 2 and E-TV News. His dream is to impart creative knowledge to South African youth, giving them the power to create beautiful things and also to support themselves, all part of his ultimate venerable ambition to "bring Africa together to make one". Bravo! 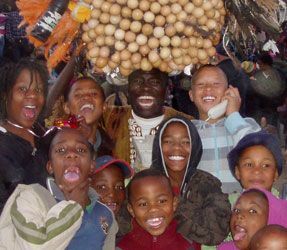 The Egg Man is 0.5km from the centre of Cape Town , the nearest airport 20.4km (Cape Town International Airport).